Image: Eurosport UK Twitter Page. 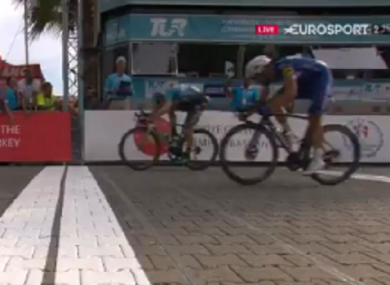 IRELAND’S SAM BENNETT has maintained his overall race lead at the Tour of Turkey after claiming his second consecutive stage win at this year’s event. Following on from his victory on stage two, the Carrick-On-Suir man prevailed once again on Thursday with an impressive sprint finish at the end of the 132.7km stage between Fethiye and Marmaris. Bennett also won this stage at last year’s Tour and his final dash to the finishing line saw him extend his lead at the top of this year’s race to ten seconds with Argentina’s Max Richeze coming home in second place. Bora-Hansgrohe’s Bennett finished second in the opening stage of the 2018 Tour of Turkey and came out on top in yesterday’s 149.6km route from Alanya. The 27-year-old finished up with four stage wins at last year’s event and he is already halfway to equaling that feat this time around. Meanwhile, Ireland’s Nicolas Roche finished inside the top 50 of this stage of the Tour of Turkey, which finishes on Sunday in Istanbul. Email “Two on the bounce! Ireland's Bennett holds onto Tour lead after bagging another stage win in Turkey”. Feedback on “Two on the bounce! Ireland's Bennett holds onto Tour lead after bagging another stage win in Turkey”.